Tomorrow, the Board of Supervisors will vote on whether to approve Muni’s fifteen-year contract with Clear Channel – giving the politically connected company free reign to advertise on the City’s 1,100 bus shelters. There is also an expectation in the contract that an extra 400 bus shelters will be installed, and Clear Channel will be able to advertise on them too. Supervisor Jake McGoldrick has raised concerns about selling out our public space to large private companies – and has authored Proposition K, which has the support of San Francisco Beautiful and a majority of the Board of Supervisors. Prop K would declare that it is the intent of the voters not to have “an increase in the number of general advertising signs on street furniture,” but unlike an ordinance is merely advisory. Which means that if Prop K passes, it would have no legal effect. Even if it were a legitimate threat, the numbers are not accurate. Under the proposed contract, Clear Channel will give the M.T.A. a one-time payment of $5 million to have the right to advertise on bus shelters. Beyond additional payments that total less than $1 million a year, the billboard company will also then pay Muni a minimum annual lease depending on how well the advertising revenue goes. Under the most generous projections, Muni would get a little over $10 million a year for the Clear Channel contract. If the bus shelters are less profitable and do not rake in the advertisers, Muni would only get about $7 million. The real winner of the contract is not Muni, but Clear Channel – who stands to keep about half the advertising revenue for its own profits. 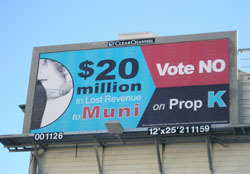 Prop K is not about making Muni lose $20 million – it’s about making Clear Channel lose $20 million. That’s how much money Clear Channel stands to gain every year from its contract with the M.T.A. If the “No on K” campaign was honest, their billboards would have said “$20 Million in Lost Revenue for Clear Channel.” But I don’t think that would be a very effective selling point for San Francisco voters. Granted, Muni needs money – but is letting a conglomerate billboard company reap the benefits worth the small amount of additional revenue? As the Bay Guardian turned 41 last week, the progressive newspaper devoted their entire issue to the perils of privatization – and how government contracts with private companies to provide basic services don’t really save taxpayer dollars. They only make it harder to avoid corruption. Fortunately, voters who want to help Muni get its fiscal house in order have other options than supporting an advertising contract with Clear Channel. Proposition A would net the transit agency an extra $26 million a year in revenue – by devoting a larger portion of the parking money towards Muni. This is a good example of how we can bring more money for public transportation without selling out to private companies. Other funding options for Muni that should be on the table for future elections is a parking tax (which failed last year after there was no grassroots campaign to help it pass), a state law to allow San Francisco to restore the pre-2003 vehicle license fee, and a downtown assessment district for property owners who benefit the most from Muni. There are other ways to raise money for Muni – without relying upon the mercy of Clear Channel. Meanwhile, Prop K is an important statement that San Francisco voters can make against outdoor advertising. We already banned new billboards on private property in 2002, and Prop K extends this to public property like bus shelters and kiosks. While San Francisco has languished in dealing with basic enforcement of anti-billboard laws, other cities – like Sao Paolo, Brazil – have made progress in combating visual pollution. Don’t let Clear Channel scare voters into thinking that Prop K would starve Muni.